I used my kitchen aid with bowl/stand. But you can use bowl with electric mixer. Beat together cream cheese and butter for 1-3 minutes/until well combined. Turn mixer to low and slowly add in flow (1/4 cup at a time) until all is added. 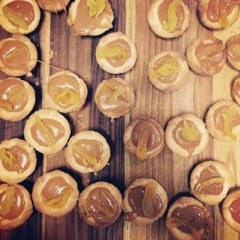 Mine are shown topped with sliced apricots but they would also be great with shaved chocolate! Oh man, I bet these taste so good. That crust sounds amazing!! I love anything caramel. These look delicious! 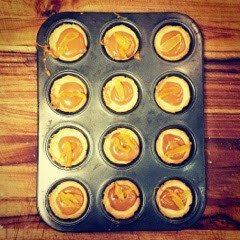 Tarts in a muffin pan. Brilliant. I avoid them because I dont have little tart cups but I do have muffin pans. Yay.